In this tutorial, we will discuss how an attorney can use various web services to enhance the process of investigating a case, specifically, when there are multiple parties involved that need to answer the same questions. For instance, when investigating a class action an attorney may often want to contact multiple putative class members (employees, consumers, etc.) and get information relevant to the case. For example in a class action employment case based on allegations that the employer failed to pay overtime we might want to submit a questionnaire. We can use an online form building and collection service like FormForAll; and, in conjunction with WebMerge, we can have the submissions made into a document that can then be sent for signature to RightSignature, or if the documents don’t need to be signed, we can easily collect them in a secure document storage location like Box. Let’s get started on how to accomplish this. Notice the brackets and the dollar sign that signify a Merge field. Merge fields are where the information from the FormForAll form will be transcribed into the document. Once we have our template document, let’s upload it to our WebMerge account. To do this, simply select New Document from the Document section. 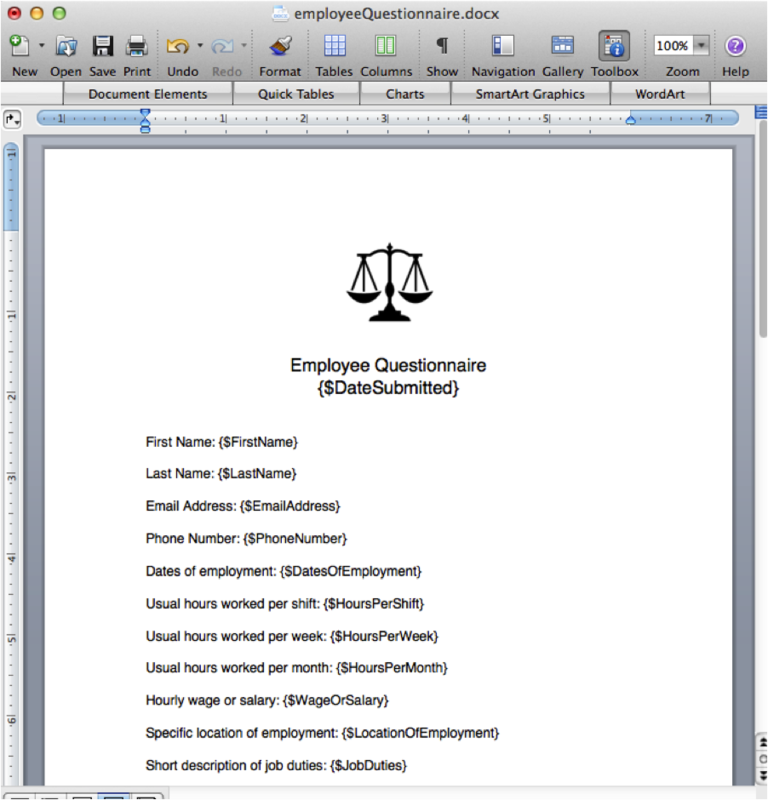 Then, upload the word document you want to use as a template. Once we have our document uploaded and our FormForAll form created with the same questions, let’s connect the two through Zapier. At Zapier, once we have created our account, we choose: Make a New Zap! Then, for step 1, we’ll choose to connect the FormForAll service with the WebMerge service. In steps 2 and 3 of the Zapier setup, we follow the instructions to connect our FormForAll and WebMerge accounts. Then, in step 4, we select the form we want to use in this connection. Please note that it is necessary to submit at least one test response to our form before connecting to Zapier so that Zapier can connect to the submissions endpoint properly. 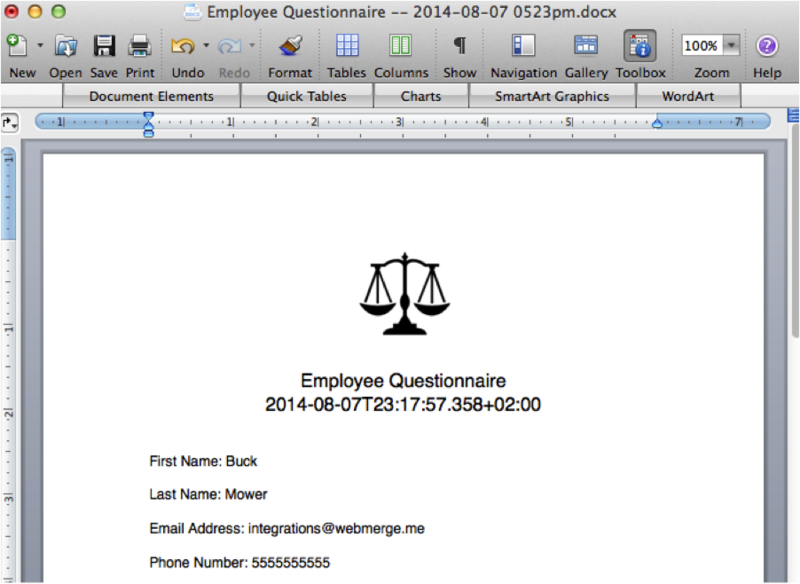 In step 5, we choose the WebMerge document we want to connect to, and connect each Merge field to the proper form input field. In the next two steps, we test our zap and give it a name. 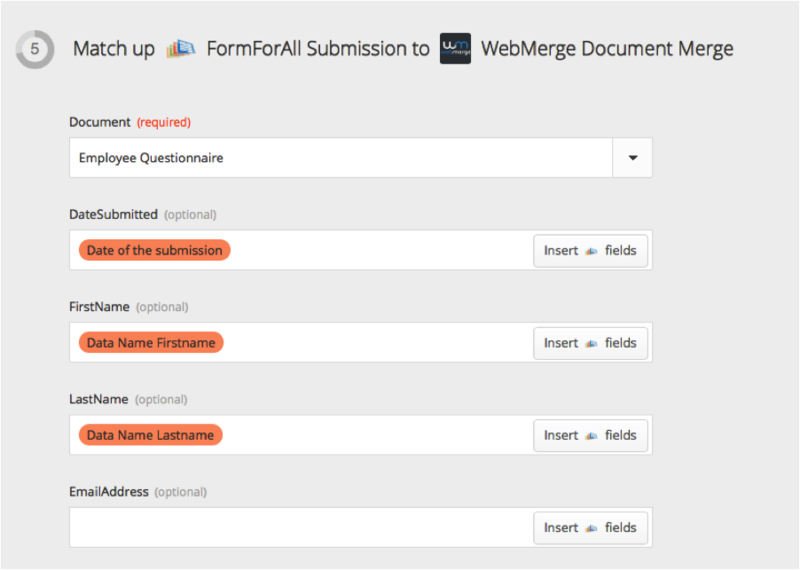 Once we’ve done that, we have successfully connected WebMerge to FormForAll and now when we get responses to our form, the responses will populate the template document we created. To go a step further, let’s talk about some of the delivery options available through WebMerge. The default delivery option is email. WebMerge will email the merged document to the email address we provided when we registered our WebMerge Account. We will get an email with our document attached each time someone submits his or her response to our FormForAll form. If we want to automatically store the merged documents in a Google Drive, DropBox or Box account, we can set our WebMerge document configuration to do so. If we want to configure our WebMerge account to automatically store the documents in our box account, we simply select box in the delivery options configuration for our document and set the root folder and description of the document in the settings panel for box. After completing all the steps in this tutorial, we’ll get our documents with or without a signature and they will be emailed to us or stored in our box account whenever a putative class member fills out our FormForAll form describing his or her employment details. 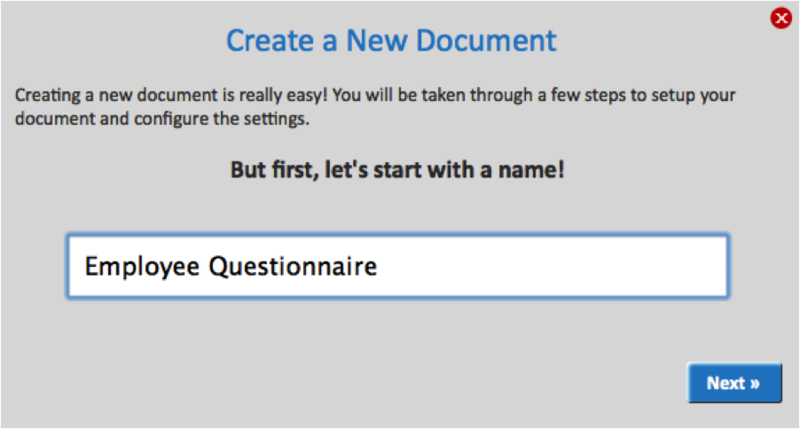 After completing the steps in this tutorial, we will have made it easy on our discovery team to collect and organize responses to our questionnaire!